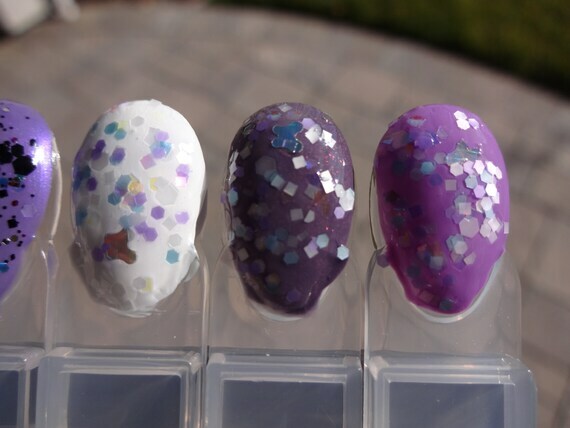 AMY’S NAIL BOUTIQUE is releasing a new collection of holographic shades sometime this week. PRETTY & POLISHED has launched a birthday club that gets you a free mini bottle of a special edition polish and a free P&P nail file when you place an order during your birthday month. Here are the details on how to join the birthday club. 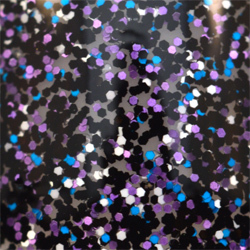 Notables: Restock of several polishes, including Random Dancing, Fire In The Night Sky Trio and Putting On The Ritzzz! Notables: Pre-orders begin and run through Friday for new colors, including Splendid, Perception and Last Call. Use code 500LIKES to get 50 percent off your order from GLITZOLOGY, good until the evening of Tuesday, January 8. 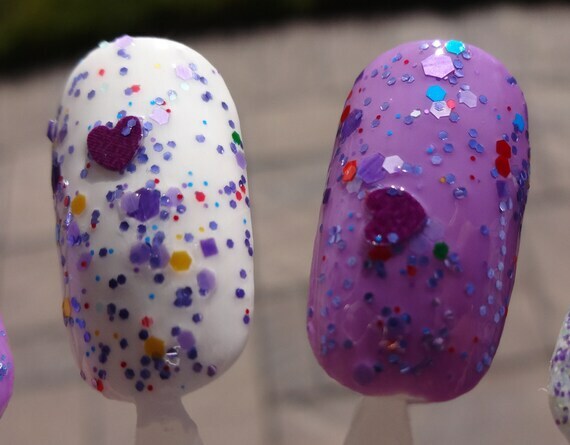 THE NAIL JUNKIE just took the wraps off her new V-Day Collection, including Cupcake, Bouquet and Love Letter. The new line will go on sale this weekend. 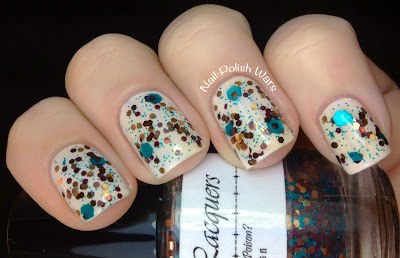 Here’s my first swatch post of 2013, and it will be short and sweet! This is Different Dimension Emily, inspired by the TV show “Pretty Little Liars,” which was on my wish list for awhile. I finally nabbed it during a Black Friday sale. 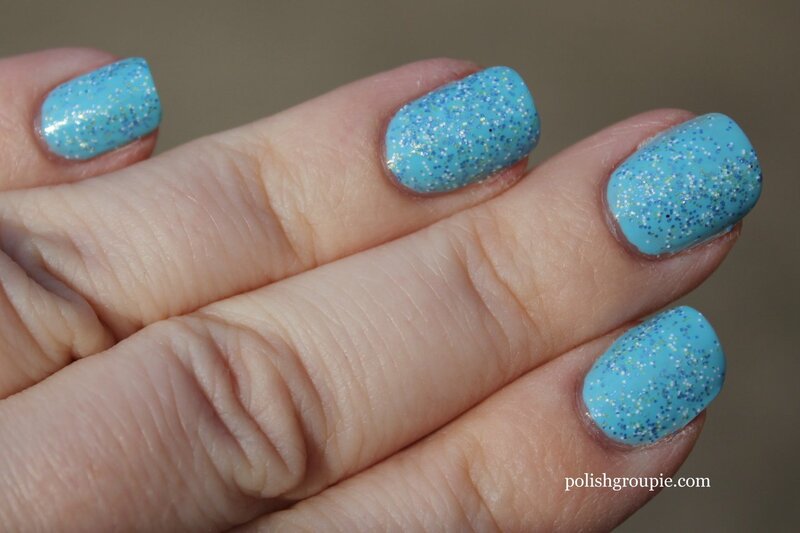 Different Dimension Emily has blue, white and light green glitter in a light blue sheer base. I’ve seen other bloggers say they used it on it’s own without undies and built it up, but I actually used something underneath. My disclaimer on this is that the application was actually done at a nail salon. It’s one coat of Different Dimension Emily over one coat of … something. The bottle was China Glaze but the name was mislabeled. 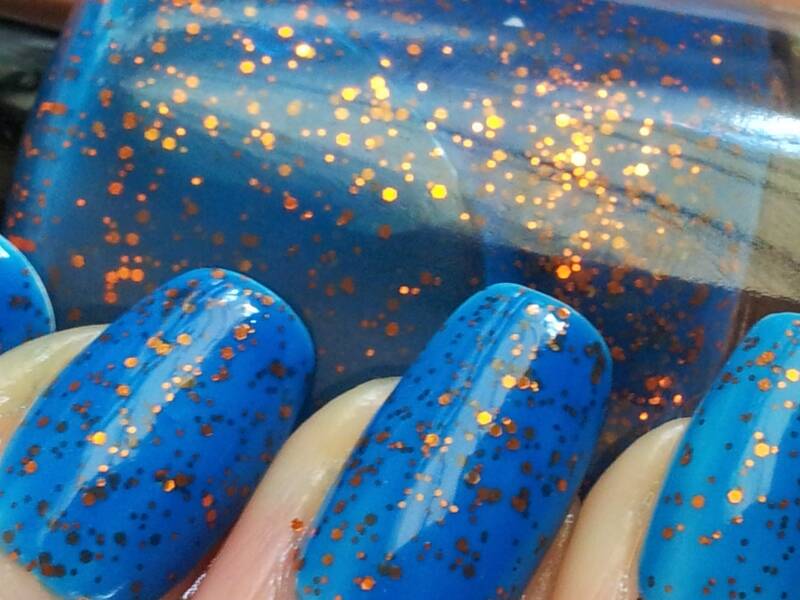 If I had to guess, I’d say it’s Bahamian Escape, but really that’s just off of swatches online. I don’t own it. If anyone recognizes it, please let me know! I love Different Dimension Emily. I think this combo looks perfect for winter, almost like a snowstorm. I think it would look great over a dark blue too, or maybe over silver. 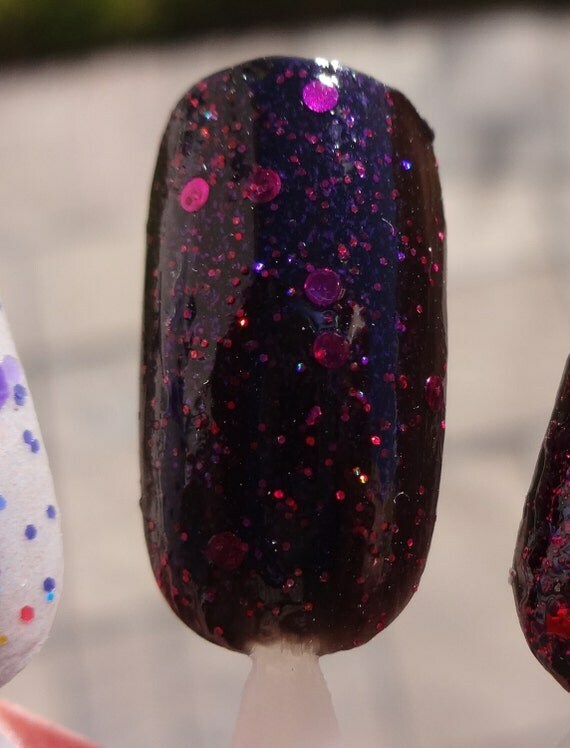 Different Dimension polish is available on Etsy. As of this posting, Emily is in stock. Happy New Year! Hope you all had a wonderful holiday. My unplanned break turned into more of an unplanned hiatus, but I’m back now. Exhausted, but back! I had all of these wonderful plans for year-end posts I was going to do, but alas, it just didn’t happen. So here’s just one, a roundup of my most popular manicures from last year. 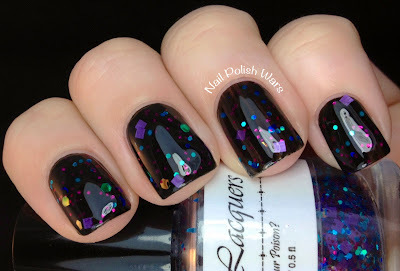 This vampire nail art manicure was part of the 30-Day Challenge I did in September, but it also got big boosts around Halloween and again in November when the last Twilight movie came out! Animal prints aren’t really my thing, or so I thought until I tried this zebra french manicure out for the 30 Day Challenge. The more I look at it, the more I like it! I can’t take any credit on the design for this bold retro wallpaper nail art look since it came from a tutorial I found online, but I did like my color choices. This silver and gold glitter gradient was actually inspired by the U2 song of the same name, but I think it made for an excellent holiday look as well. You ladies love glitter gradients! This one was part of Breast Cancer Awareness month and was done in honor of my grandmother, so I’m very glad this was my most popular post of the year. 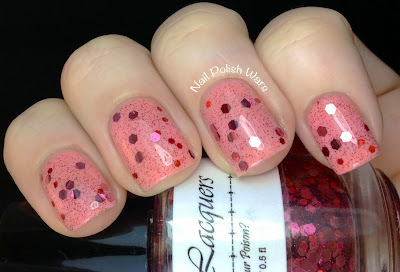 I LOVE dotticures, usually ones that I see on other people, but I really loved the way this gradient dot manicure came out. Thanks very much to everyone who visited my blog last year. Wishing you health, peace and prosperity in 2013!